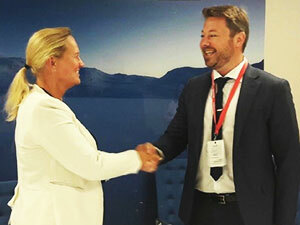 Elisabeth Vike Vardheim, EVP Constructions at Statnett, and Espen Bostadløkken, Norway Country Manager, Grid Solutions, GE Power, shake hands after signing the contract to build a new substation in Oslo, Norway. GE’s Gas Insulated Substation will improve electrical grid security and management of renewable energy resources. Oslo – September 27, 2017 – GE Power (NYSE: GE) will provide a new substation as part of Statnett's upgrade of the main power grid in Oslo and Akershus. The Gas Insulated Substation (GIS) will provide increased capacity and improved security of supply to the network as Statnett prepares for a more diversified energy consumption. The upgrade of the main power grid is part of Statnett’s Greater Oslo plan. Norway’s population is expected to grow 21 percent from 2015 to over 6.3 million by 2040. It is also the country with the highest per capita number of all-electric cars in the world and where electric or hybrid cars make up almost half of all new vehicle registrations in a year. Consumer behavior is also changing, with more opting for electrical heating as compared to oil boilers. The strong population growth coupled with new technology within heating and transport make it necessary to upgrade the mainstream power network, which dates back to the 1950s. "Demand for electricity is increasing and in turn requires a more modern grid that can securely and efficiency support greater capacity. We are proud Statnett chose GE to contribute technology and expertise to this important upgrade that will help to safely provide more electricity to the people of Norway," says Espen Bostadløkken, Norway country manager at Grid Solutions from GE Power. GE Power AS will deliver a new transformer station at Smestad, the largest in Norway that caters to general consumption. The contract includes, among other things, complete station construction, a new 420 kV gas-insulated plant, 9 switch fields and a new control building. The project will be managed from GE's offices in Oslo. The new plant, which is being built underground, will be completed in 2021. The main power network is currently powered by 300 kilovolt (kV) voltage. This will be upgraded to a higher voltage level (420 kV) after the old wires and substations have been replaced. With higher voltage, the new network will be able to transport around 60 percent more power. This will provide increased security of supply for people living in the Oslo region. Increased capacity in the new network in Oslo and Akershus will enable more power to be transported with fewer wires. In the long run, it will thus be possible to free up land in the region. The new plants will also provide a more energy efficient power grid where less power is lost on the way to the consumer.